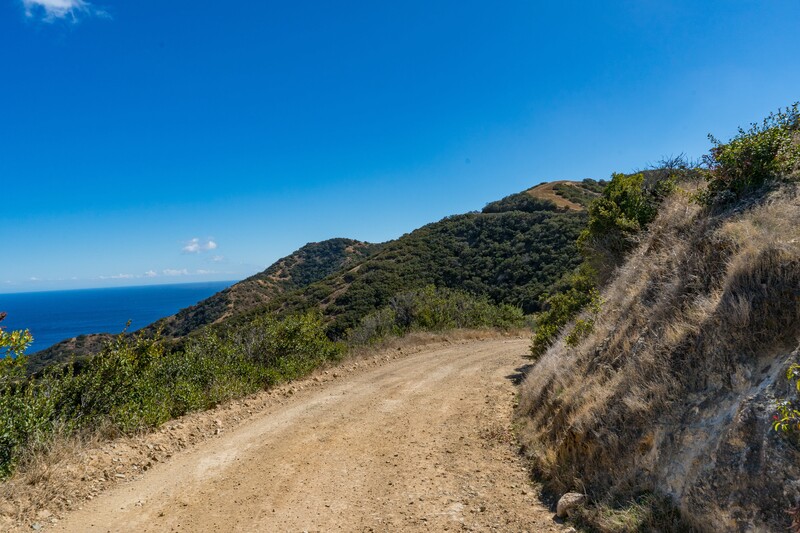 This is a travel trip report, if you would like to hike across Catalina, I recomend the Trans Catalina Trail. 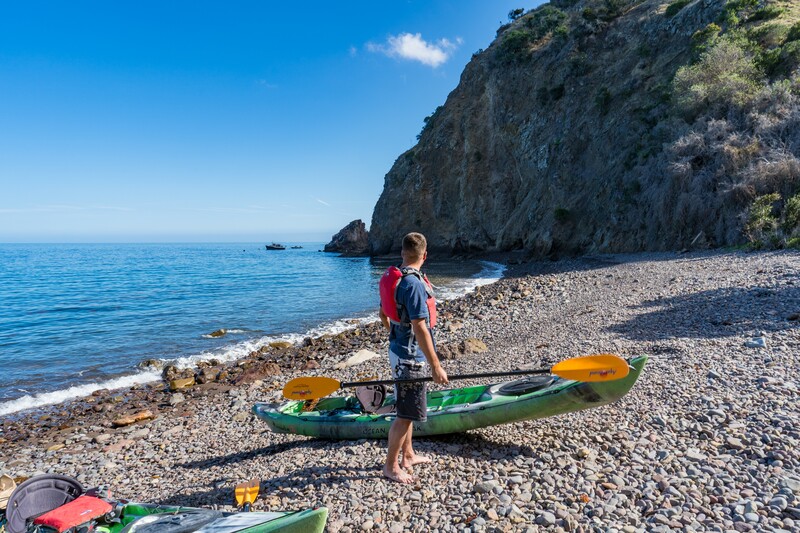 Or if you prefer kayaking, I also have a kayak camping trip report for Catalina too! 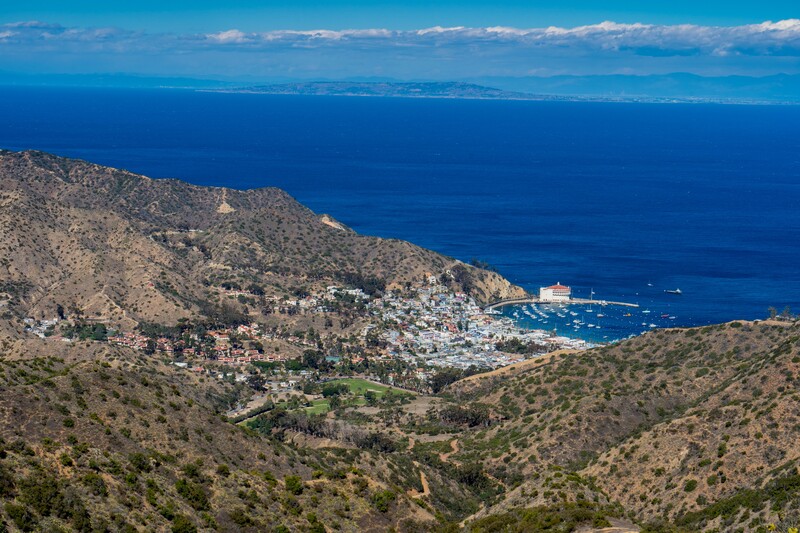 I have been living in Southern California for a few years now, and have always wanted to take the trip to Catalina Island. We honestly just booked the ferry, and hotel and didn’t do a whole lot of research or pre-planning for this trip….just kind of winged it but we loved it. We first tried to book a ferry out of Dana Point since we live south of LA, but that ferry landing does not have as many trips out as the Long Beach Catalina Express, so we chose to drive a little further North in order to be able to leave on a later ferry on our last day on the island. The ferry ride over to the island was a beautifully smooth ride and lasted about an hour. If you are staying a couple nights on the island, you leave your luggage in the back of the boat while you sit either inside or outside on top and enjoy the views. We didn’t utilize it but there is a bar on the boat serving drinks if you don’t plan on driving when you get on the island! As we neared the Island and saw the town of Avalon for the first time, I was shocked! I felt like I was arriving in another country, not just another town in California. 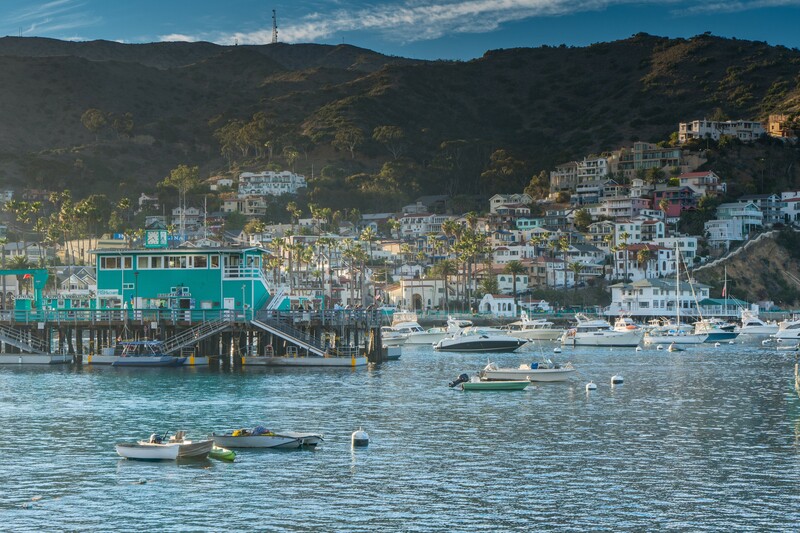 Avalon looked beautiful from the boat with its multi-colored homes sitting on the hills peacefully overlooking the harbor. We ended up staying at the Glenmore Plaza hotel, which is apparently the second oldest hotel in California just after Hotel Del Coronado in San Diego. The Hotel, was definitely old and didn’t have an elevator which made climbing the four flights of stairs every time we back to our room some great exercise. Our room on the fourth floor was definitely recently renovated and it ended up being a great place to stay. I would just skip the provided breakfast and enjoy something nicer in town. The hotel provides free transportation to and from the Ferry, but we chose to roll our luggage through town and take in the beautiful sights. When you first get off the Ferry it is a little crazy with all the people flooding into town, and the people lining up to board the ferry to leave town, but an hour or so after the ferry arrives everyone seemed to disappear and it felt like we had the entire island to ourselves. After dropping our bags off we just roamed the streets and explored the island, and over and over again I just could not believe how beautiful the small town of Avalon is! In just an hour boat ride we had escaped the hustle and bustle of Southern California and ended up on this quaint Island Paradise. Its the perfect place to go if you just need to get away for a day or two and unwind. We ate a huge, late lunch in Long Beach before riding the ferry over so we didn’t go out anyplace for dinner on Catalina after watching the sunset. 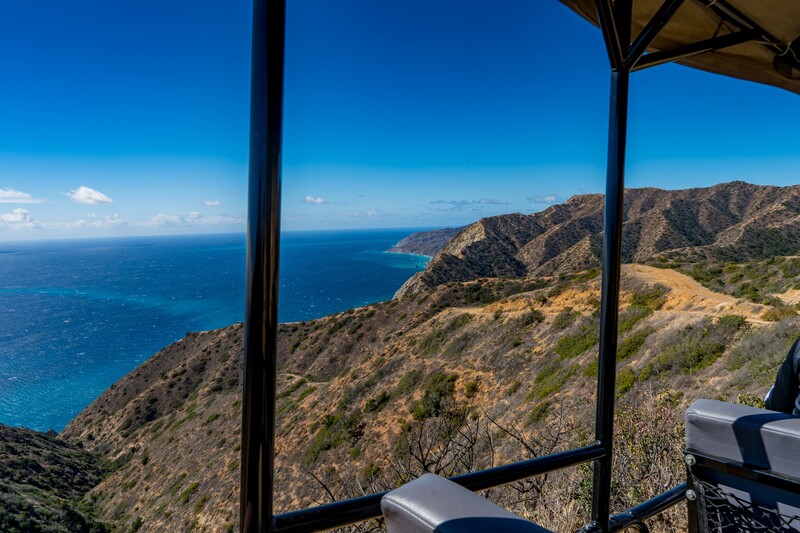 Instead, after the sun went down we explored and took a stroll up to the Catalina Chimes Tower at night. This is a paved road “hike” up a hill, with not a whole lot of street lights so definitely take a flashlight if you plan on walking up here any time at night. I forgot my headlamp so we were just stuck with our phone lights….but I didn’t forget my tripod and camera gear! 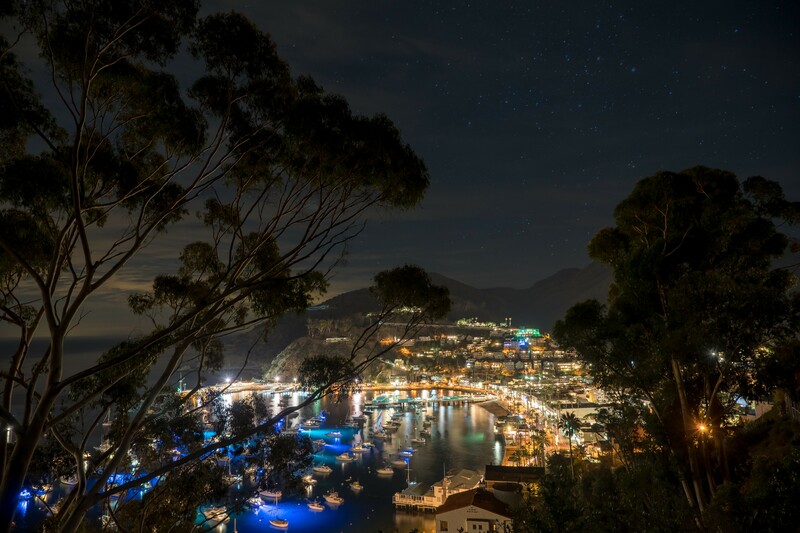 Once the sun went down, we had some amazing views of Avalon at night! 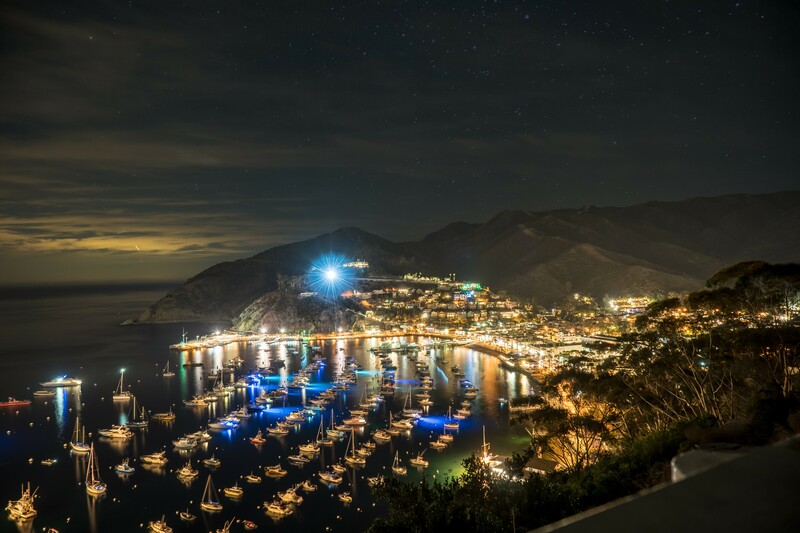 After spending some time photographing the night cityscape of Avalon, we hiked back down to our hotel and dropped off the camera gear in our hotel. By this time we got a little hungry but not enough for a huge meal, and it was getting late. We were looking for a quick lite bite, some good drinks, and a little fun. We ended up hearing some live music and followed our ears straight into Luau Larry’s bar. It was packed on this winter evening, and we were lucky to get a chair with a view of the live music. I picked out some delicious buffalo wings and we ordered two “Hurricanes” which were about the size of our heads. Since I love Alan Jackson and Jimmy Buffet I was singing Its Five O clock somewhere all night long…. The next day was our first full day there, so we packed the camera, some wine, and a picnic lunch and headed out to find some kayaks. 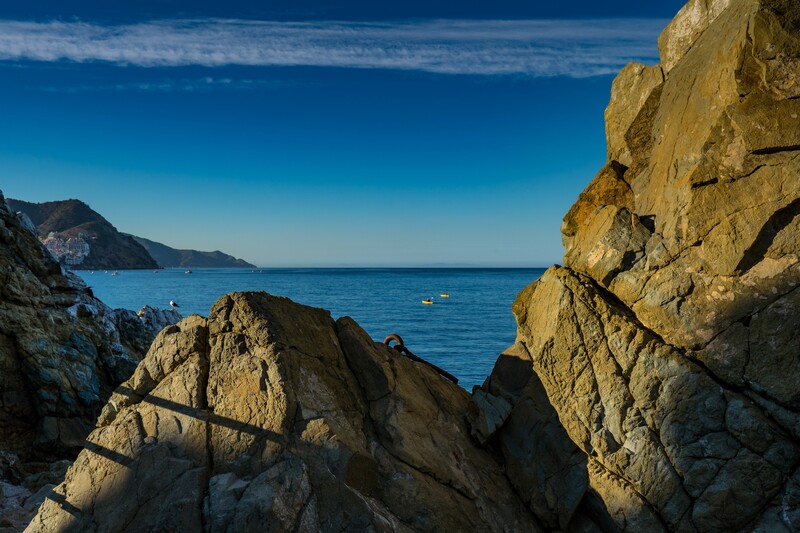 Its a little bit of a walk but we headed over to Descanso Beach Ocean Sports and rented to Kayaks to take out along the Northern coast of Catalina. If you like wine check out Goverre, saw them on Shark Tank a while back and they worked great taking some wine for the beach picnic lunch! As we pushed off the beach, I was amazed at how crystal clear the water was, we could see straight 30-40 feet down to the bottom and saw a ton of beautiful fish as we paddled along the rocky coast of Catalina. As we paddled along we eventually came to a beach where there was a little picnic table past the rocks where we beached the Kayaks, we sat here and enjoyed a great picnic lunch before paddling back for the day. Our second and final day we decided to check out a couple of the tours they offered on the island. When we woke up to check out of the hotel we were carrying our bags down the four flights of stairs, and another family on vacation asked us if they were going to let us get off the island. I was a little confused but they told us all the boats were canceled for the day due to the wind and rough seas…. Our boat wasn’t supposed to leave until later that evening, but we talked to the hotel just in case. They assured us that if we were in fact stranded we would get the “stranded” fee which was 20% off and that we would be guaranteed our room back if stuck. They also assured us the coast guard gave out slips we could bring into work for our bosses…luckily after texting my boss, he didn’t seem to mind if I got stuck for one more day. We ended up just checking out of the hotel and leaving our bags behind the counter, and decided to just enjoy our day as regularly scheduled and worry about the boat later. Our first adventure of the day was to go off-roading and explore the island with a tour guide to the highest peak overlooking Avalon. It was definitely a bumpy tour, but we knew what we were getting into and really enjoyed the tour. Our Tour guide was fantastic! The road didn’t get much worse then what you see in the above picture, but if you are not a fan of heights there are a few points you may not enjoy. But its worth the view of the island! After the off reading tour, we had a couple of hours before our ferry left, and we were looking to squeeze one more tour into our schedule. We walked over to the Catalina Island Casino (Not a gambling Casino) and they happened to have a tour just that was perfectly timed for us if our ferry was still going to depart. To be honest I was not super excited about this tour but thought I would give it a chance since it was one of the iconic landmarks on the island. I have to say, I am glad I gave it a chance, because the tour was fantastic, and it was neat to learn about all the film history on the island. 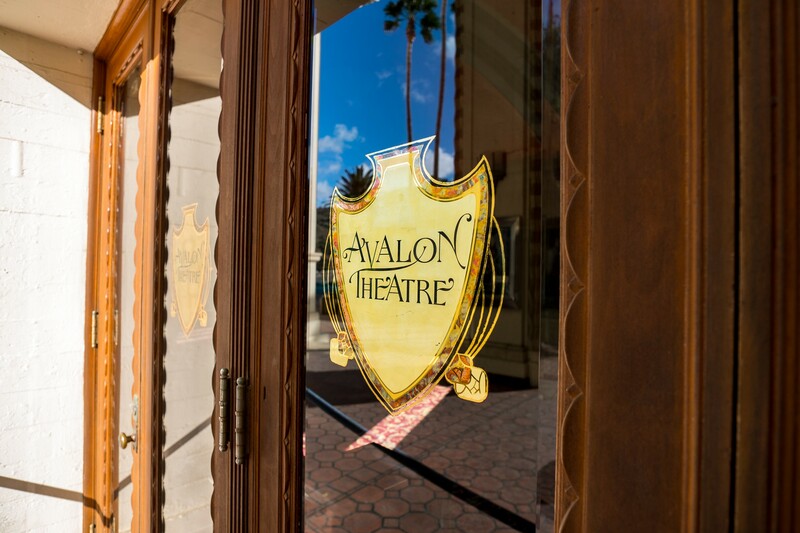 The bottom of the Catalina Casino is an extremely old theater, which they still show movies in! You can watch the latest blockbuster hits while you are on the island and catch the organ playing before the movie! We didn’t get to watch a movie there but did enjoy an awesome behind the scenes tour! 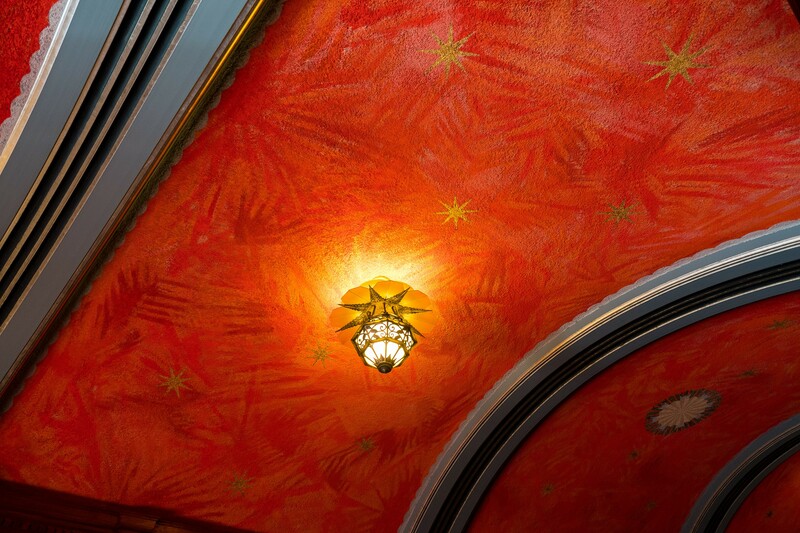 If you look closely at the picture of the ceiling, you can see that they were painted with palm leaves! After learning some awesome history, and checking out the old changing rooms and levels which controlled the curtain we were brought onstage and they raised the curtain and we got to see the theater for the first time, it was stunning! 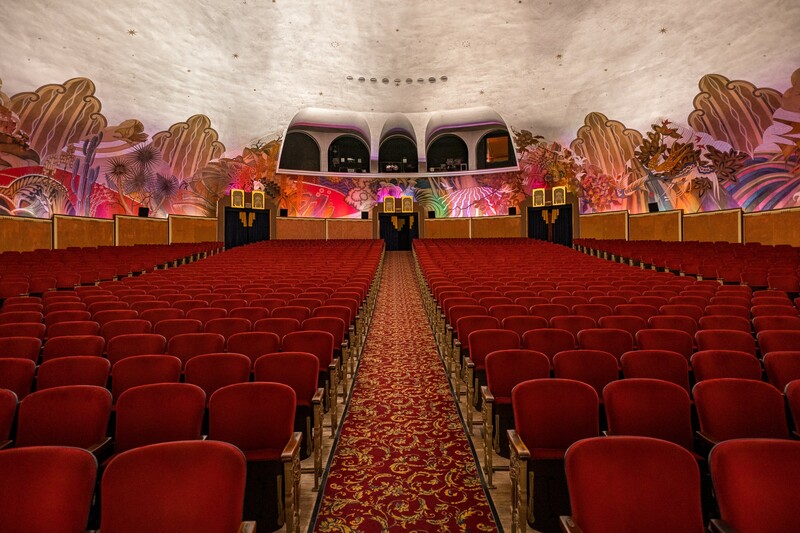 This theater was designed specially for “talkies” the first movies that came out with sound. As a result of the sound design, the acoustics were crazy! As the tour guide talked it felt like his voice just fell down on us, and was better than any surround sound I have ever heard…and there were no speakers involved when he was talking to us! 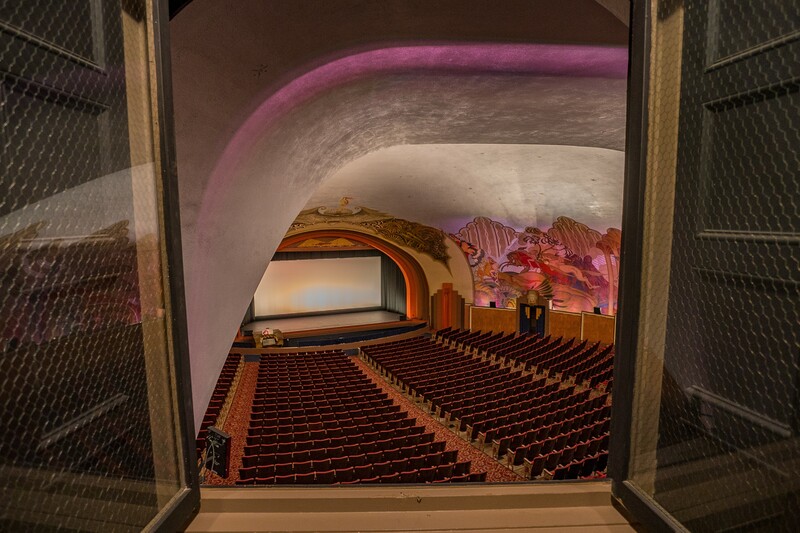 As we were leaving the theater to head up t the ballroom upstairs, our tour guide mentioned there is a Catalina Jazz festival every year in the theater! 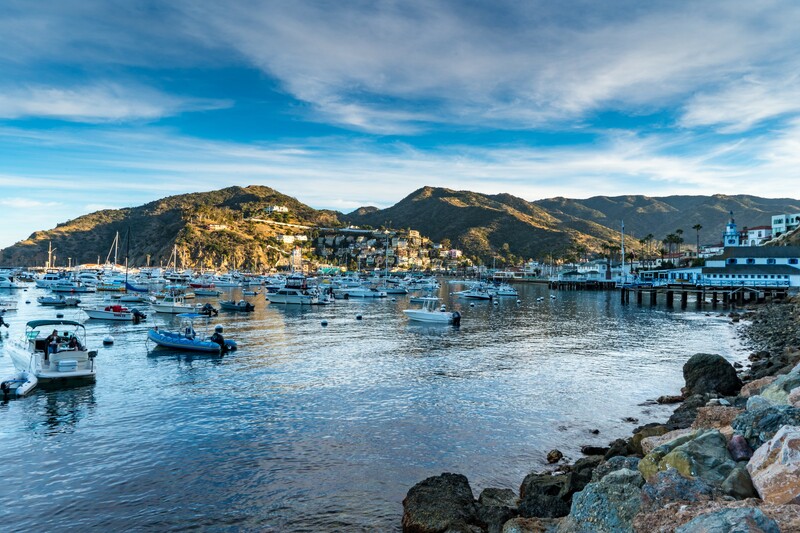 Jazz festival on Catalina is officially added to my bucket list! As we moved upstairs we got to see a private viewing room and the film projectors which were fascinating. 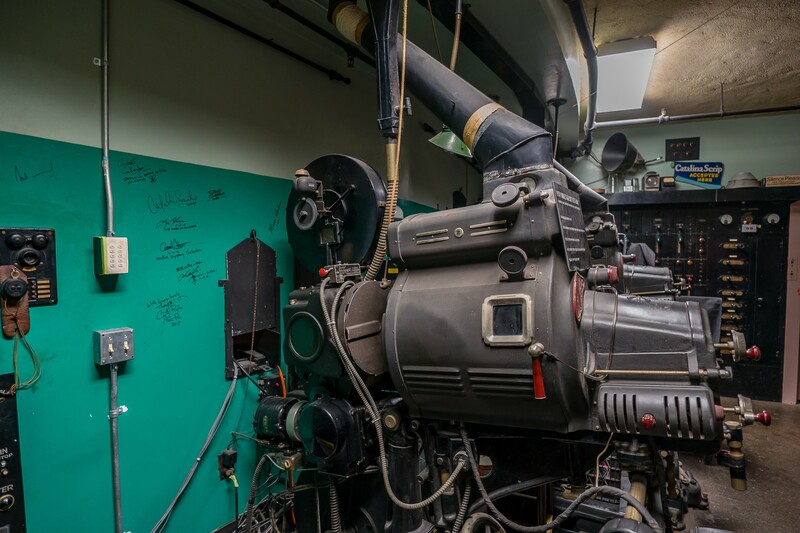 They have an original film projector and a modern day project, which is great for seeing how technology has evolved over the years! 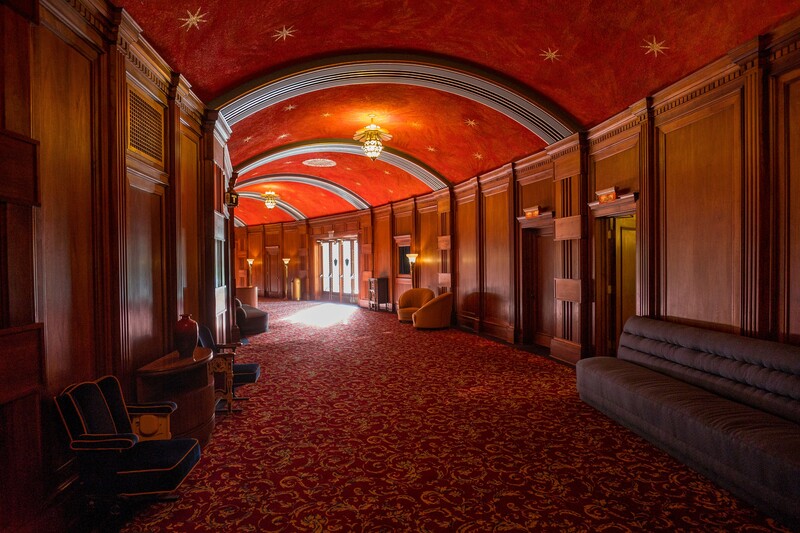 After viewing the projecting room we headed up specially wide designed ramps for moving guests into the huge ballroom that sits on top of Catalina Casino. 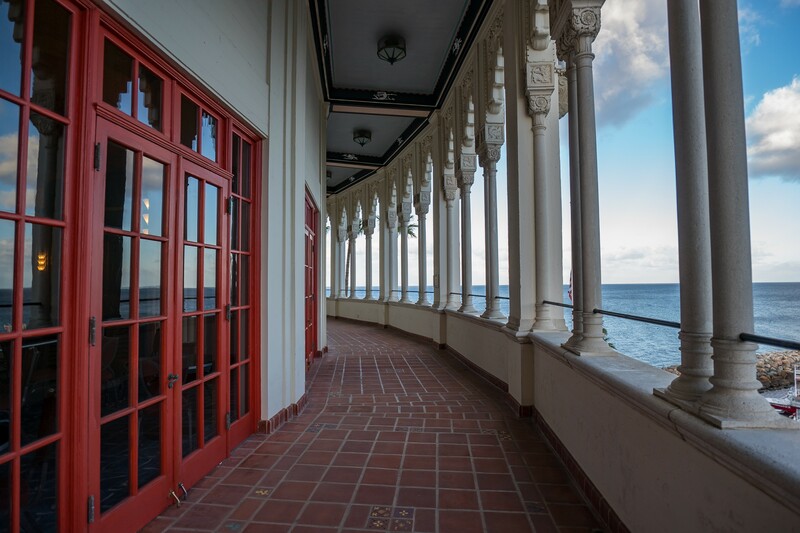 When you walk through the doors of the ballroom you are greeted by a huge dance floor surrounded by panoramic views of the ocean! 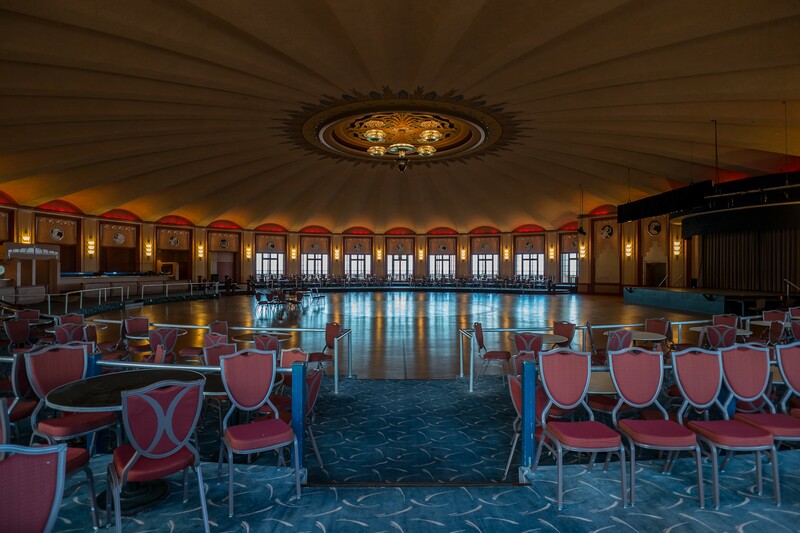 The floor of the ballroom has never been replaced and events are still held there today. One of their bigger events is a New Years Eve party, which is the second item I am adding to my bucket list from this trip! 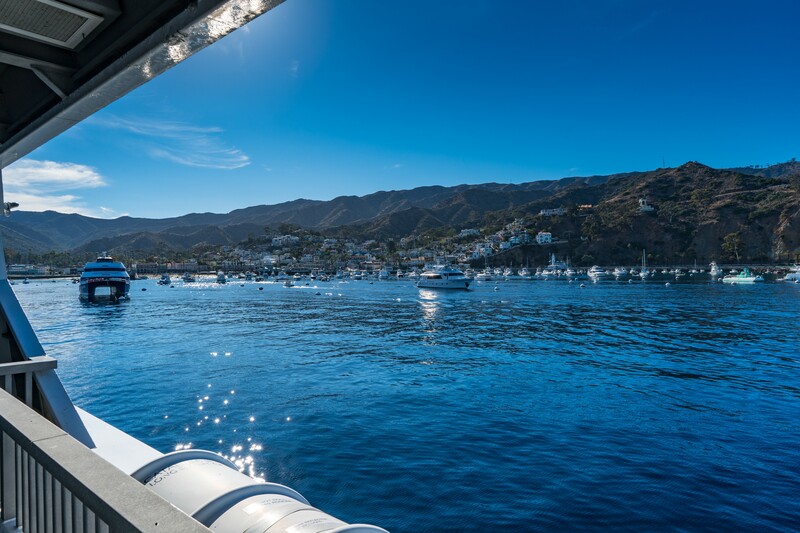 After the wonderful tour, we made it back to our hotel and called the Catalina Express ferry. The Coast Guard ended up allowing the ferries to run again and we ended up being one of the few boats that left the Island. It was a fairly crazy trip back on the ferry due to the large swells but neither of us got sick. 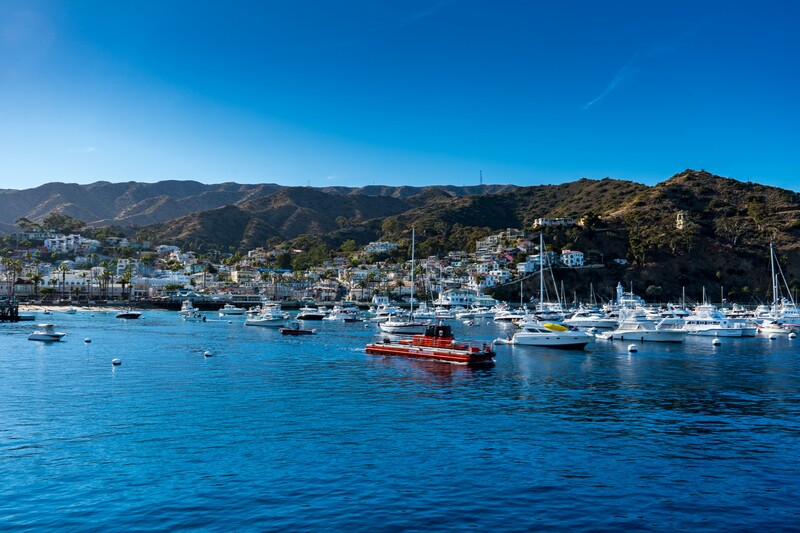 Catalina Island and Avalon ended up being an awesome quick get away from southern California, and I can not wait to get back to the island again!